Bites By BridgePort Cafe Episode 1 Recipe! 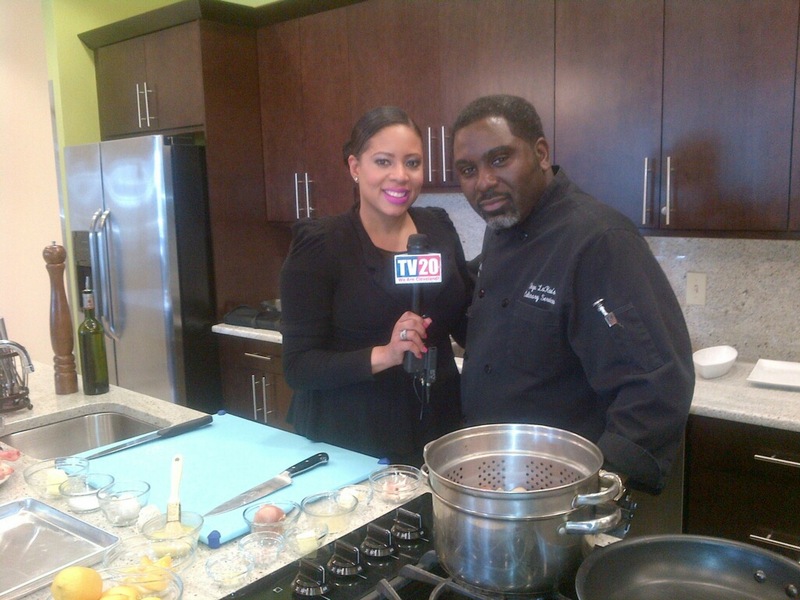 This entry was posted on April 3, 2013, in Cleveland and tagged Bites by Bridgeport Cafe, Ciarra Nelson, city of cleveland, Cleveland, cooking, cooking show, food, recipe, tv, TV20, TV20 Cleveland. Bookmark the permalink. Preheat oven to 400°F. Place chickens on rack set in large roasting pan. Starting at each cavity end, slide hand between skin and breast meat to loosen, being careful not to tear skin. Arrange lemon slices under skin to cover breast meat. Season each cavity with 1 1/2 teaspoons salt and 1/2 teaspoon pepper. Stuff each with quartered lemons, garlic, rosemary, and thyme. Flip wings of each chicken back and tuck under body. Using pastry brush, brush melted butter over skin of each chicken, then sprinkle each with 1 1/2 teaspoons salt and 1/2 teaspoon pepper. Roast chickens, basting with pan juices every 15 minutes, until skins are crisp golden-brown and juices run clear when thighs are pierced, about 55 to 60 minutes. (Instant-read thermometer inserted into thickest part of breast should register 170°F.) Remove from oven, then remove lemons, herbs, and garlic from cavities and discard. Reserve pan drippings. Transfer chickens to carving board and tent with foil to keep warm. Preheat the oven to 450 degrees. In a large pot, boil approximately 4 quarts of water. Slowly add the potatoes to the pot and par boil for about 3 minutes. Remove and drain potatoes. Set potatoes aside to cool slightly. In a large bowl, combine the olive oil and lemon juice. Add the potatoes to the bowl and toss lightly to coat. Add salt and pepper, continuing to toss. Cut a large piece of heavy-duty aluminum foil. Laying the foil flat, mound the potato mixture in the middle of the foil. Sprinkle rosemary over potatoes. Crumple the ends of the foil to make a basket, keeping an opening in the middle. Place the foil packet on a large cookie sheet and roast for 20-25 minutes, or until the potatoes are cooked. Remove from oven and place potatoes in a serving bowl. « Bites By BridgePort Cafe Premiere!